“Why don’t you ask the shaman directly? He’s at ease now, since we’re waiting for low tide,” the organiser said. 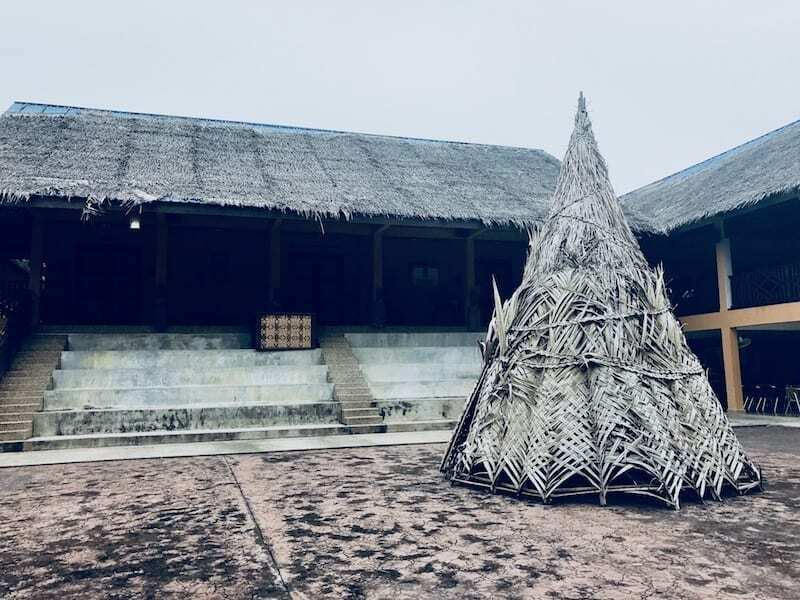 He led me over to the rough wooden platform, bedecked in nipah frond origami decorations, and sat me down before the head shaman of the Mah Meri in Pulau Carey. I could hardly believe how lucky I was. I felt even luckier when I was told later by a young woman there, that this isn’t usually allowed. “Ask!” prompted the organiser. So I asked: why were the flags and the shamans’ clothing mainly in yellow? And the cloth wrapped around the totems in the Ancestors’ Hut as well? Was there a special meaning to yellow? I knew in Malay culture, yellow symbolised royalty – the status colour of gold. I also knew that there was a folk Malay practice to wrap yellow cloth around monoliths. So I wondered if it was related to either one of these. But the shaman told me, the colour was specified for the Mah Meri of Kampung* Judah, by the spirits. Other villages of the Mah Meri might have different colours. Nor does it necessarily have to stay yellow. If a shaman while in a state of spirit possession (menurun) receives a new preference of the spirit, then it would change accordingly. I was in Pulau Carey (Carey Island), a tourist guest at the Mah Meri people’s Spirits’/Ancestors’ Day, or Hari Moyang. It actually spans two days. 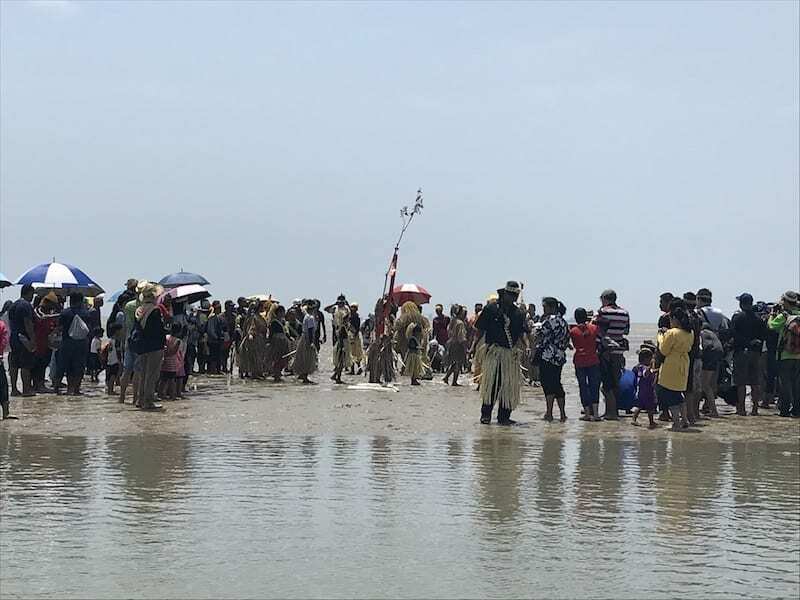 The villagers had gone to a different part of the shoreline the previous day, to commemorate the spirits of their ancestors who had perished there when their ship sank on a stormy day, long ago. But today the festivities turned cheerful. For they were commemorating the ship that did not sink, and came safely to shore. 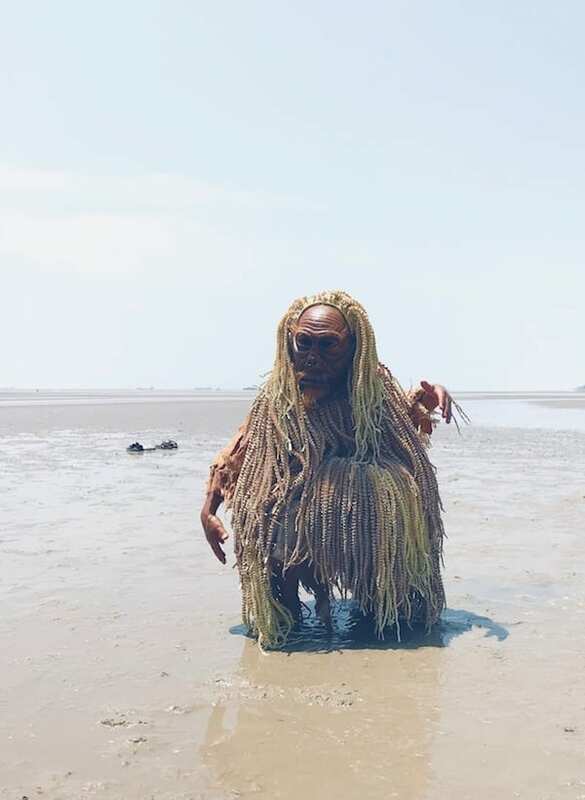 All through the intercession of the Guardian Spirit of the coastline, Moyang* Getah**, who is credited for the succour of the surviving ship. 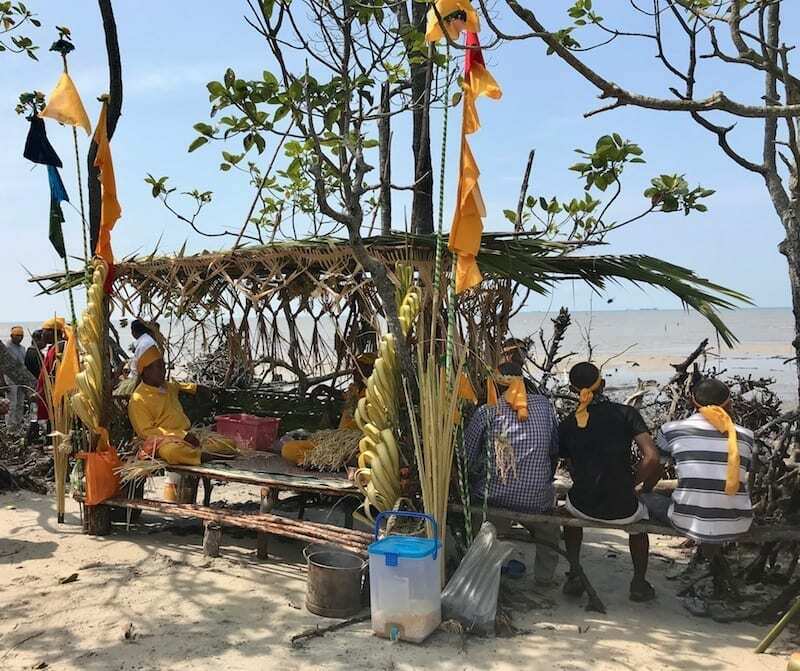 Today’s ceremony was puja pantai, a worship ritual meant to honour the coastal spirits. Once common to the coastal-living nations in the archipelago, the practice died out as the communities embraced Islam, surviving only in the aborigine nations who still hold animistic beliefs, such as the Mah Meri. While I sat with the head shaman, everyone was killing time. Waiting for the low tide. “Why?” I asked. Swinging incense and beating drums, the villagers walk in procession to the puja pantai site. This is by far my favourite reason for asking questions when I find myself in these situations. On TV programs and books in which (usually) Western adventure personalities, archaeologists or anthropologists go to ‘primitive’ tribes, the explanation always has some kind of mystical or esoteric meaning. So, being the academic sort, this is also how my mind jumps. It looks weird to me = it has a meaning I can’t relate to. Sometimes, sure. But less often than you think. When I ask directly, and to people in the know (like shamans), more often than not the answers I get are plain and practical. I can totally relate to them. In fact, anyone can. I value this perspective correction. Besides, it is a constant source of amusement to me. “Next month there is another one,” remarked the head shaman, offhand. “Another what? Ceremony?” I asked. He nodded, and explained that next month the Mah Meri of Kampung Bumbun would have their Ancestors’ Day. Say what? All this while I had assumed the Mah Meri of Pulau Carey, numbering only about 4,000, were all one nation. Yes and no. This coastline of Selangor, the area of the Bay of Panglima Garang (I rendered him “Lord Furious” in my attempt to make the legend more relatable for my Anglophile readers) is the range of the Mah Meri nation. There are five villages on Carey Island, he said, ticking them off one by one. I asked him, whether Kampung Bumbun would also come to the coastline for puja pantai. He shook his head. 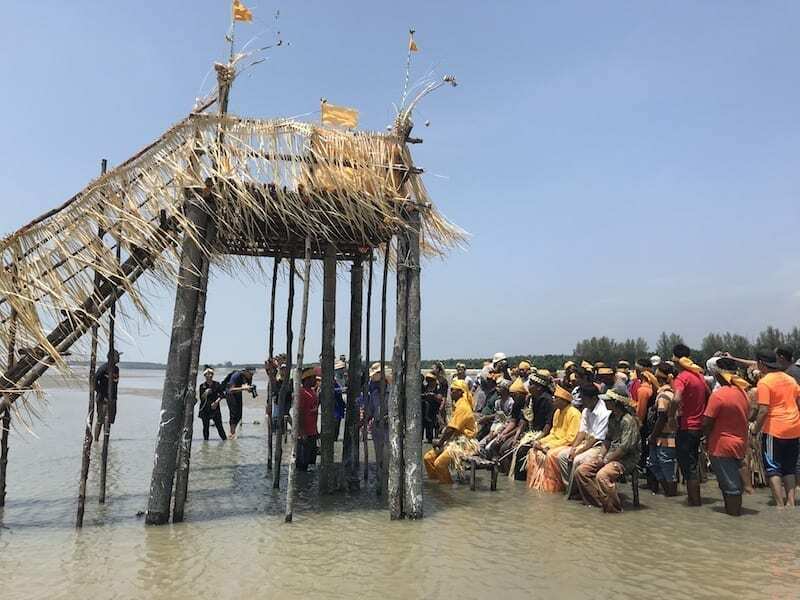 Kampung Bumbun has an ancestors’ day, but no sea worship. They’re a little inland. 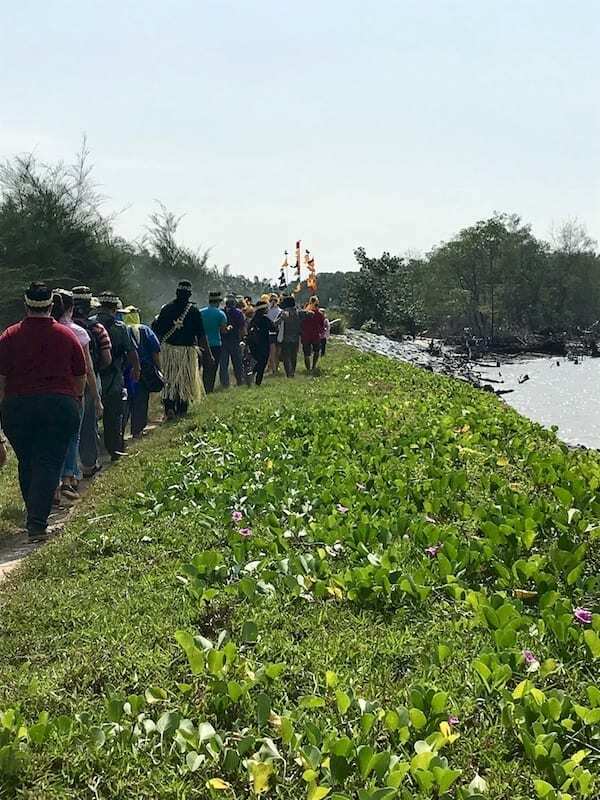 Kampung Sungai Kurau, also by the coastline – theirs has a puja pantai ritual too. I glanced up at the hanging decorations dangling from the roof of the shed. 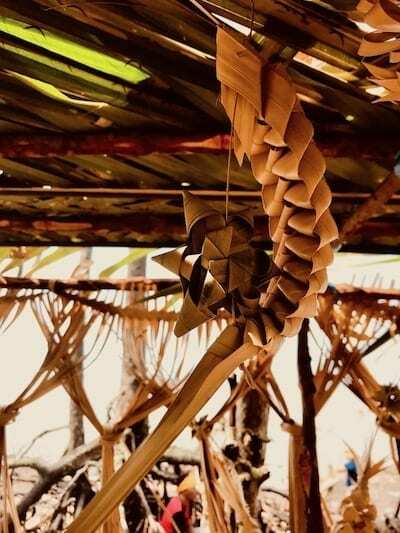 They were intricate, birds and flowers and corn woven like origami from the fronds of the nipa palm that grew around the briny marshes here. Upon my own brow was an origami crown which they had given to guests that day. The art was familiar; I’ve seen it across the region – all the way up in Vietnam, and as far west as the Maldives. However, the intricacy and skill I saw among the Mah Meri surpassed examples I’ve seen before. Certainly it far outstripped my own Malay people, among whom this art survives only in the making of ketupat. One caught my attention – I had not seen that shape so far that day. It was a crescent and star. I asked him about the nipa origami. He smiled, and shrugged, claiming a lack of knowledge. “It’s the art of the womenfolk,” he said, losing interest. I asked him about the bizarre wooden sculptures the Mah Meri are perhaps known for, to outsiders. At times grotesque, and always surreal, the artists’ often draw inspiration from Mah Meri animistic beliefs of spirits in nature. 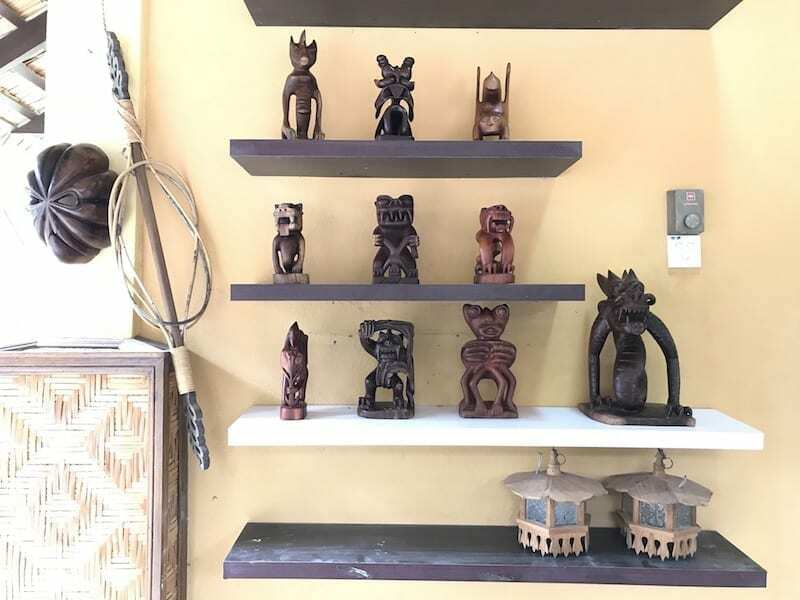 22 sculptures were awarded the UNESCO Seal of Excellence, and are displayed in the gallery of Mah Meri Cultural Village in Kampung Bumbun. The shaman explained that he did not know very much about that, because the Kampung Judah people do not really have this art. However the Kampung Bumbun, and perhaps Sungai Kurau peoples, are quite skilled. Yet more micro-diversity that I had not expected! I racked my brain, trying to think of further questions while I had this golden opportunity. I had them just a moment ago! But a young woman caught my eye. She was motioning for me to come away. Time’s up. I took my leave from the head shaman, and came off the platform. I wandered onto the beach to bide time. How not? There was the sea, and she always pulls me like a magnet. So I skirted around the mangrove roots and out under the burning midday sun. It was not quite low tide, but it was almost all the way there. The sand flat was exposed for quite a distance, and nearly all the way to the ceremonial high platform that the Mah Meri had decorated for the reception of the Guardians. I allowed myself to be distracted by nature. The bleak mangroves and the regular rippling pattern on the sand. 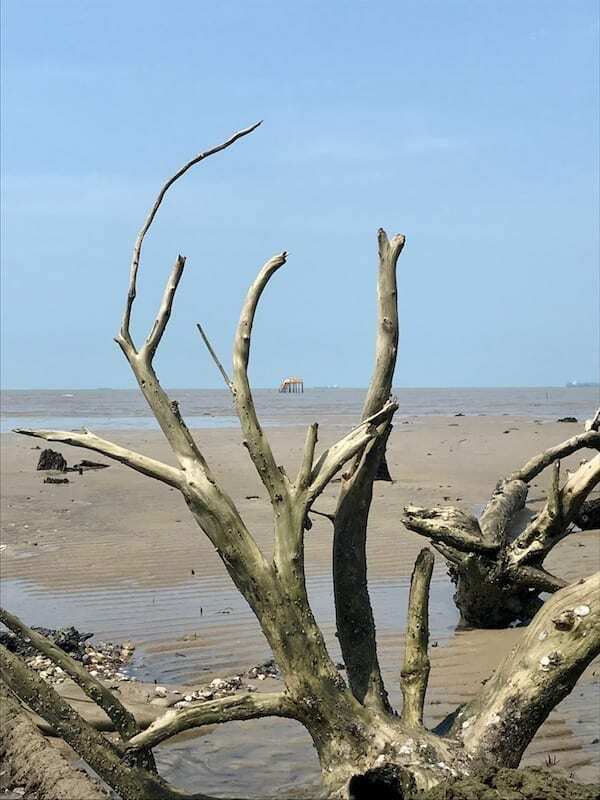 Wan saplings here and there – signs of past attempts to re-plant the mangrove, perhaps. Mudskipper fish skittering and leaping in the tide pools, occasionally lifting themselves up with their pectoral fins and crawling across the damp sand. Finally I simply sat, looking out to the sea. Far on the horizon, container ships move grandly across – the harbours of Klang are close by. The Mah Meri children had also grown restive by this time. Their attention span had run out. They clambered over the mangrove roots, and before long were playing at chase all across the sand flats. I had already visited Carey Island last year. Seeing the children chasing each other, laughing with abandon, took me back to that time. When I watched an impromptu chase being waged with the Kampung Bumbun children around the street near the Cultural Village. That was the moment when I knew my guest was special. 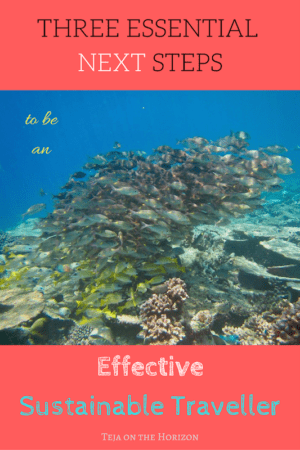 Early last year, when I returned from my second trip to the Maldives, I grew restless by inches. I had been accustomed to the rapid pace of things happening following my Blue Period, pulling me hither and thither as fast as I could keep up. As if re-positioning me, re-arranging my life after the metamorphosis. Learning how to speak. Learning how to live all over again – as this me. I see now why people say ‘born again’. But then there was a hiatus. 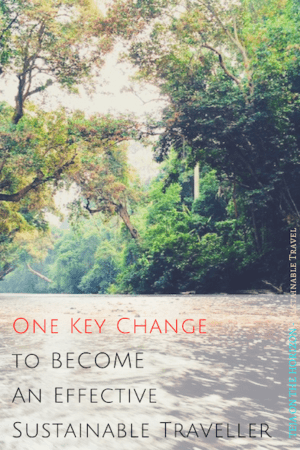 And though I kept busy learning how to have a travel blog, I began to feel out of sorts. Perhaps the universe was done putting me back together and turning me the right way around. I felt prodded to move, but I didn’t know where to. To make it even more vexing, I had a couchsurfer who was constantly asking for things to do, despite seemingly constantly having a full dance card already. I kept thinking about the Meetme event I saw, which was for this very festival last year. I was intrigued; the notion attracted me. What’s more, it’s so close. Carey Island is only an hour’s drive from Kuala Lumpur, an easy half day out. Actually I had already long wanted to go, even before I learned about the Mah Meri. By the time he asked last year, the Hari Moyang was over. But I decided we could still check out the Mah Meri Cultural Village. So I proposed a day trip to Carey Island. My couchsurfer asked me, how good it would be. I don’t know. I’ve not been myself. That’s the point of exploring it, I replied, somewhat testily. How on earth could someone claiming to be all about novelty, have no tolerance for the risk of exploration? Or be unable to create novelty if the situation does not present it? I was determined to go. And he decided to come along. And that’s why I already knew about the Mah Meri sculptures and ritual masks, when I came again for Hari Moyang. The tide was deemed to be sufficiently low. Indeed, the water receded quite a distance away, leaving a wide ground around the offering platform. I remembered the shaman saying, Hari Moyang is about 5 days after Chinese New Year, which is always on a new moon. Though it was approaching neap tide, the ebb tide still exposed a great field of sand. The drummers began a simple marching beat. The shamans’ assistants went ahead, bringing the food offerings and to begin preparing the ritual site. Villagers and tourists alike followed behind them. 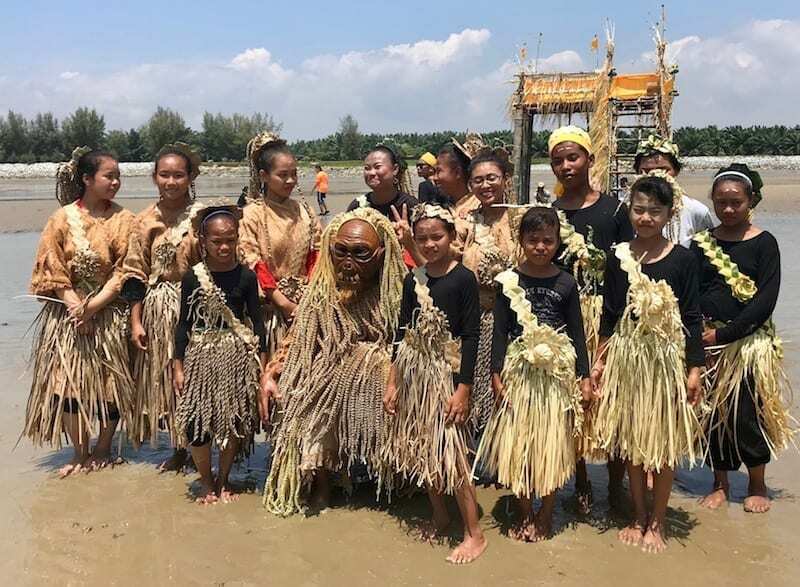 Bringing the rear were the Mah Meri maidens in their traditional clothing of terap bark and nipa fringe, hair decorated with origami creations. The tall offering platform was rustic. It looked out to sea and was cheerfully decorated in yellow flags and nipa fringes. Offerings that are considered to please the spirits are placed on the platform at the start. Before the ceremony begins, and every so often during it, attendants sprinkle it all over with a kind of water. A small conical totem woven and decorated with origami arts were brought up to the fore, but placed at the side. Two points were marked before it in a straight line – I was told it represented the route of the ship that survived, and the route along which the guardians of the coast would be invited. I guess you could say, it represented the red carpet. Moyang Getah would approach the platform along this route, and afterwards the shamans would dance with them (as well as ensure the spirits leave afterwards – very important!). The visitors stood on either side of the invisible ‘red carpet’. The shamans sat in a row behind the platform. The drummers continued to play, keeping up a discreet beat, as the shamans prepared to enter a trance. Incense wafted around from a metal container set by the platform. Eventually the music shifts as one of the shamans – dressed in grey rather than yellow – stepped forward in his trance. He approaches the path before the platform and begins a kind of trembling dance, stopping at the first marker. I wondered if he would proceed to the second marker. The visitors become excited, and began taking photos and videos. Beginning to encroach into the path. FOMO causes others to move in as well. Mah Meri youth tasked to maintain the sanctity of the ritual site were forced to order the tourists back. The shaman returns to his place behind the platform. We waited a long while after that – at least 15 minutes, I reckon. I don’t know whether it was normal or if the ceremony was disrupted previously. Would it normally shift depending on how many shamans could successfully achieve menurun and channel the ancestors? Were the spirits offended, or disinclined to come? The exhibition in the Cultural Village did give a more detailed description of the ceremony. However, it seemed to me that cultures that maintain its character from pre-Industrial Age times, are typically not standardised as ‘modern’ people often expect it. While standardisation to some degree has always been around in human societies, the notion that every sphere of life should be standardised, is actually relatively recent. Meanwhile, the platform was being prepared again with the water sprinkles. The attendants mixed something in an offering bowl. 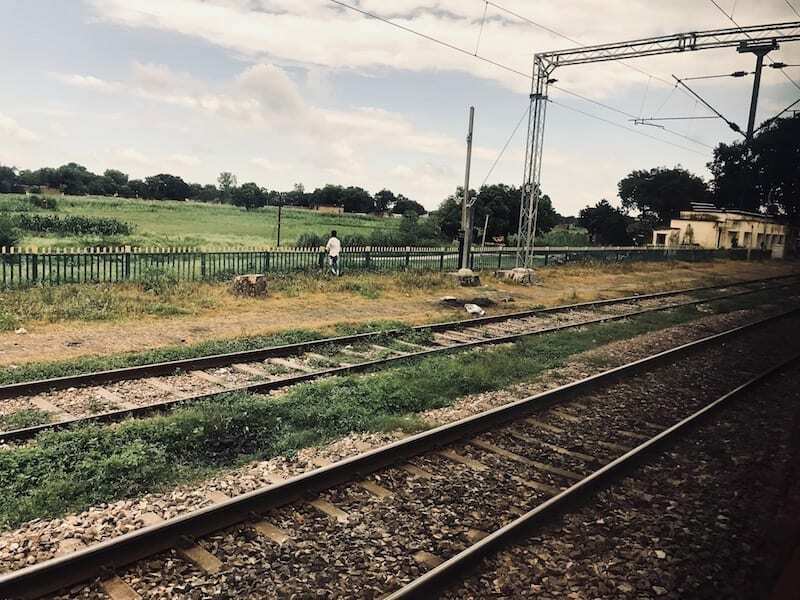 By this time I had decided to move closer to the platform, where I could observe the shamans and attendants. Considering it was faux pas to cross the spirit path, block it on the far end or encroach into it, I quickly worked out that there was actually no point to stand with (often much taller) other visitors. The view from slightly behind the platform was much clearer as well. And I was closer to the actual ritual, too. The drums continued to play, and the villagers began chanting. The head shaman rose from his seat and walked in a stately manner to the front of the platform. He ascended it, spending some time there as the chanting continues. He then descended, walked around it, and returned to his seat. An attendant began sprinkling water on the platform once more. I took advantage of the lull to ask the organiser about the shaman in the grey clothing. Was he a different kind of shaman? I wasn’t sure he got the point of my question, or perhaps my question made no sense in the Mah Meri context. However, he did point out to me that the shamans were dressed in Malay-style clothing. Come to think of it, it was so. They were not wearing Mah Meri traditional clothing. He said it was because the sea spirits were Malay, so they dressed accordingly to please them. The attendant began the summoning. He called upon the spirits by name, inviting them to partake of the food offering on the platform, and in the honour of the day. Presumably the invitation was accepted. The music shifts to a more upbeat tone – very like a Malay traditional dance tune. The head shaman moves forward and begins dancing in the space between the platform and the first marker. It was very like the zapin, a Malay traditional dance. Goodness, he was right! If the guardian was an ancient Malay spirit, these would be the things it might like. I was reminded strongly of a question I asked my colleague in Bangkok, about some fancy clothes hung up on a random tree. He said, it was for the tree spirit. He told me to note that the style is an old, traditional style. This was because the spirit is supposed to be from that era. I was distracted from the head shaman’s dance by photographers congregating on the other side of the platform. I quickly worked out why. A Mah Meri masked dancer had shown up, and obligingly posed for photographs. He was covered almost entirely in nipa fringe and origami tassels, and wore a carved wooden mask. 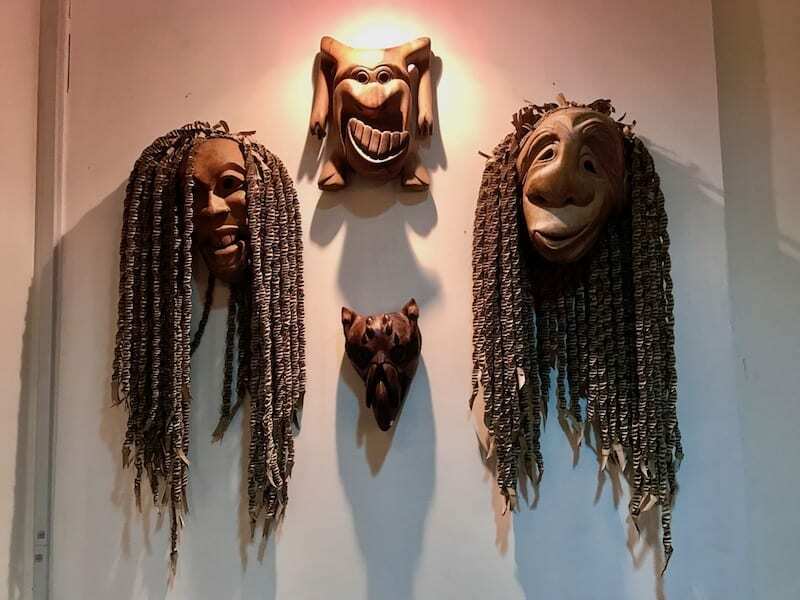 The third generation to wear the same mask, I overheard someone say. He also wore a huge round belly – almost as if he were pregnant. Meanwhile the conical totem was brought forward and placed at the first marker. The Mah Meri maidens come forth and began the traditional Jo’oh dance around the totem. The shamans stood nearby, presiding over them. I took it as a sign that the ritual was over, and the festivities had begun. The masked dancer rushed forward and began dancing joyfully – and somewhat comically. He stamped lightly and shook his tassels, belly wiggling. Visitors were invited to join in, and before long the Jo’oh circle was filled with people. Among the first things the organiser told us when briefing us at the start of the day, was that the Mah Meri were ‘not like us’. I wasn’t sure if he meant the modern Malaysians generally, referring to their different worldview, or the Malays specifically, because they look pretty much identical to us. And indeed, they are different. They arrange their society differently, believe differently, and so have different value priorities. But that day I was more struck by the things that were similar. They greet their elders just like we do, and just like I’ve seen Filipinos do in more traditional settings – with a bow to kiss the elder’s hands. Their percussion instruments are similar to ours, and while the rhythm doesn’t sound familiar, at one point they did sound very close to a typical kompang beat. The food that they brought for the feast at the end, was also very close to Malay foods. I wondered how much of it was a later cultural influence from being such close neighbours, and how much was what we had in common from an earlier age. The Mah Meri are considered an ‘original people’ (orang asli) of the land, and fall under the Senoi ethnic group. Various tribes of the Senoi people are found all along the Malay peninsula. So their presence in Pulau Carey is often assumed by ordinary Malaysians to pre-date the rise of states and empires in the region, because this is typically the case for orang asli in general. But interestingly it is not so for the Mah Meri. They have two origin stories for their settlement in Pulau Carey, and both place them later in time than other orang asli. The scholarly opinion has them migrate south to the Pulau Carey area from Indochina, based on genetic research and language similarity – they speak Mon Khmer. Even so, interestingly no one really minds that the Mah Meri may have arrived ‘later’ to the peninsula. No one disputes their status as orang asli, based on the cultural similarity to Senoi tribes who have been here since pre-history. Their own oral history traces their origin to Kota Linggi in the territory of ancient Johor, where the last Sultan of Malacca*** fled following the fall of his capital to the Portuguese in the 16th century. His subjects – including the ancestors of the Mah Meri – dispersed when the heirless king died (and consequently, also the protection of the throne’s authority in exile). Some of those fled to Pulau Carey. I personally don’t understand why the two views must conflict. Perhaps there was already a Senoi people in Carey Island, who came from a Khmer region. And perhaps the sea gypsy subjects of the fallen maritime Malacca empire fled into their lands, merging into one community. Perhaps that is why a tribe whose name means “forest people”, has a coastal culture today. That day I watched a people with a face like my face, displaying a culture that they might once have had in common with my ancestors. It was brought home by a remark from a local man, answering a question from another Malay girl. It was about the material of the blouses of the Mah Meri girls – wood fibre from the terap tree. What indeed? We did not grow cotton here. There were no real fibre crops. Why did the seafaring and plains tribes of the region have woven clothing? Why did we form monarchies and states? It was because of the ability to have both agriculture and trade. So we had weaving and threaded clothes. Excess wealth meant a need for, and the ability to fortify cities. A territorial state means the ability to send and receive diplomatic missions. The foreign influence means new ideas. That was how this region obtained Hinduism and Buddhism from India. And later, Islam. And that accounts for everything that is different between us today, whose ancestors were here together in those old and ancient times. We who are born into this era are used to the fixed borders of political states as the default way to see the world. Whether we came before or after the formation of the state matters. Whether we were born on one side or another of a border matters. It is a matter of nationality. But for the vast majority of human history, this was not so. Tribes defined their unit by social ties and kinship. Territory is a thing you have to range in for resources, it was not a concept that defined your tribe. Even when there were states, the borders were porous. If you pledged yourself the subject of a king, and obeyed his laws, very likely that was enough. In fact, I met an Indonesian woman there who I first thought was a Sarawakian. She is Dayak, which is a tribe in Borneo. Indeed in the aborigine worldview, her Dayak identity is enough. But in our modern world, she is Indonesian, whereas other tribes of the Dayak nation across the border in Sarawak, are Malaysian. There are good reasons why the world changed the way it did. But my point is that the change to nationalism is very recent. In the evolutionary human psyche, what feels more natural to us came from the aeons before. So we struggle in trying to make territory-based citizenship work in a psyche that sees it as kin- or allegiance-based. I wonder if this age of stern political states is a permanent new normal of human history, or will it end up merely a blip in the dominant human experience of overlap and fluid exchange? It is not merely a philosophical question in an age of the greatest refugee crisis in history. And for the Mah Meri, boundaries of land and the concept of ‘owning’ it, is a very real question. You see, Pulau Carey is close to not one, but two major ports of Klang – Port Klang, and Westport. The latter is being expanded even while port volumes are in decline. And yet, there is yet a third port being proposed, right on Carey Island. 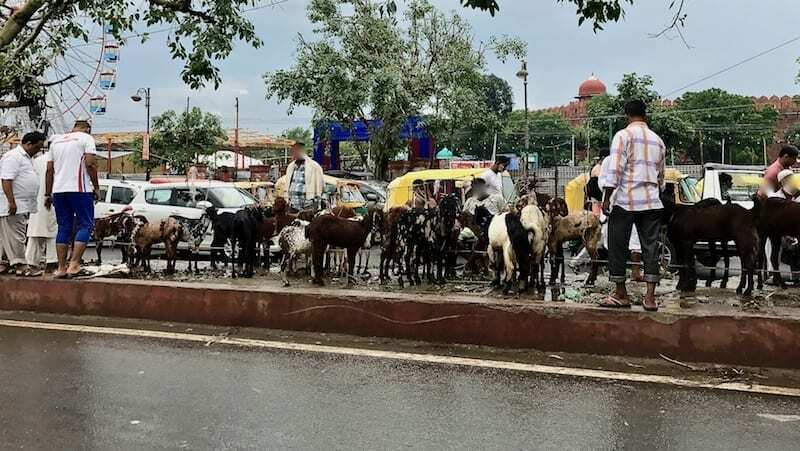 It was what I thought about, when I watched the silhouette of cargo ships in the background, as the villagers went forth to their ritual platform. Like a different kind of sea spectre. Not a guardian. But the omen of a future exile. If you have the opportunity to sign up for this unique cultural experience, here are some tips to help you have a good time. 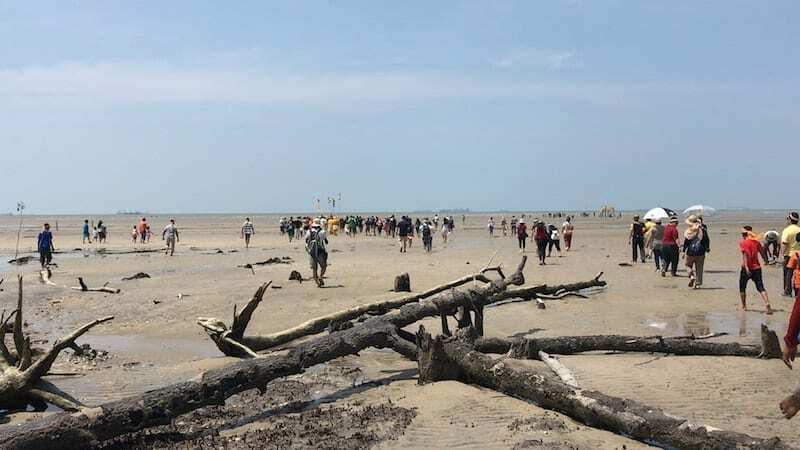 The puja pantai is conducted out on the sand flats which are only revealed at low tide. 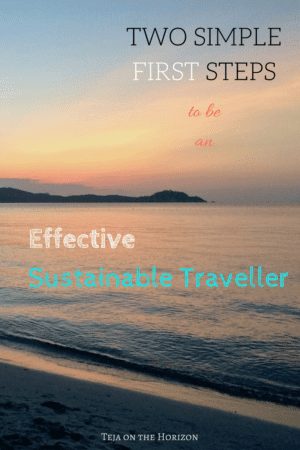 Wear trekking sandals, or flip-flops. Or at least shoes you can easily wash afterwards. Dress is casual, although it is the Mah Meri major festival. I did make a token effort, mainly because I would have dressed a bit for my own and others’ festivals. I felt if I went full casual I would not be giving them an equal treatment. It is an outdoor ritual under the sun though, so whatever effort you make should still be practical. To blend in, aim for roughly the degree of modesty that locals go for. If low tide is around midday, it will be really hot. Bring your own bottle of water. The organiser will likely include bottled water as part of the tour, but there is no need to generate the plastic waste. This is a country with very low recycling rates. If you go as part of a tour group, lunch is probably included. But it will be back at the Cultural Village and not with the village feast. Depending on what time low tide is, lunch may be delayed. So eat a good breakfast if you get hungry easily. There are tide apps to find out when low tide is. Pulau Carey is near the primary harbour of Malaysia, Port Klang, so the tide calculations for Port Klang would serve. 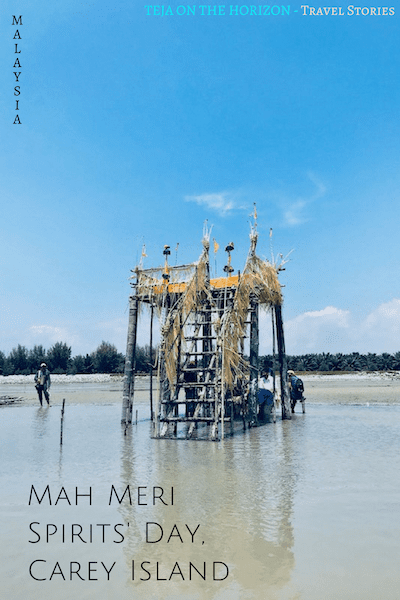 The puja pantai is a religious ceremony carried out as an expression of the Mah Meri culture and not for the benefit of tourists. It is not a performance. I was aghast to observe so many guests failing to appreciate this, even after being made aware of what not to do by the locals in charge. It seemed to me that the bigger your camera, the more you feel entitled to film and photograph aborigine people in intrusive ways, and in a manner they had expressly forbidden. If you do not like for people to stand between a devotee and a Buddha statue, camera thrust in between incense stick and the altar, don’t do it to others. If you do not like for people to wander back and forth in front of your prayer row while the imam is leading congregational prayer, don’t do it to others. Etc. You should not have to wait for people’s anger to know it isn’t right. They are people just like us. This is not a zoo exhibit. When you ask to attend other people’s religious ceremonies, be aware that it is real for them. Even if you don’t believe yourself, respect means you recognise that they do. For those with good intentions, but simply don’t know enough, I can fix that. The entire length from the far marker to the offering platform is the path for the spirit. A width of maybe four feet on each side was cleared when I was there. The spirit, being a sea spirit, will approach from the sea. Therefore it is rude to stand at the end of the path (where the left arrow points to), no matter how awesome that angle is for your photograph of the platform (where the right arrow is pointing). Wait until the ritual is over. Since the entire length is the ‘red carpet’, do not cross it for any reason. If a VIP is about to get out of a car to walk down the red carpet, nobody jumps the rope to cross in their path. It’s rude. Also, crossing faster does not make you invisible. Nor does smiling sheepishly. Walk back to the platform and cross behind it. Do not crowd or approach the shamans during the ceremony. They are most likely in a trance, and channeling an ancestor spirit from the hidden world. Firstly, they are not in an aware state, and/or you might displease the spirit possessing him. Secondly, the people believe it is dangerous for you, because the spirit may decide to inhabit you instead – and then be difficult to dismiss. These last two are really just general etiquette. If you want a close-up photo of dressed-up people, it’s not that hard to ask them for permission. Even if they do not get angry, it’s still rude. Just because they’re ‘native’, does not make it ok to take close-up or zoom shots of children, or stop them randomly for photos. If you don’t like some random guy approaching your children in the playground asking them to pose for photos for his personal and undisclosed use, why is it ok just because the children are aborigines? Think about that. And please, talk to others about it. *moyang = literally: great-grandparent, although also used for any ancestor beyond this. Throughout this region, family designations are also used as honorifics even for unrelated people, the respectful weight increasing with ancientness. For example datuk (grandfather) is often used as a term of honour for people in authority. Hence, the most venerable kin title of moyang can be used as a term of deep respect for guardian spirits, which is a different usage than for spirits who were literally one’s ancestors. **getah = ‘rubber’ or ‘tree sap’ in Malay. Not at all related to rubber trees; it refers to the supernatural pull upon the boat to the shore, as if there was a stickiness cast upon it. 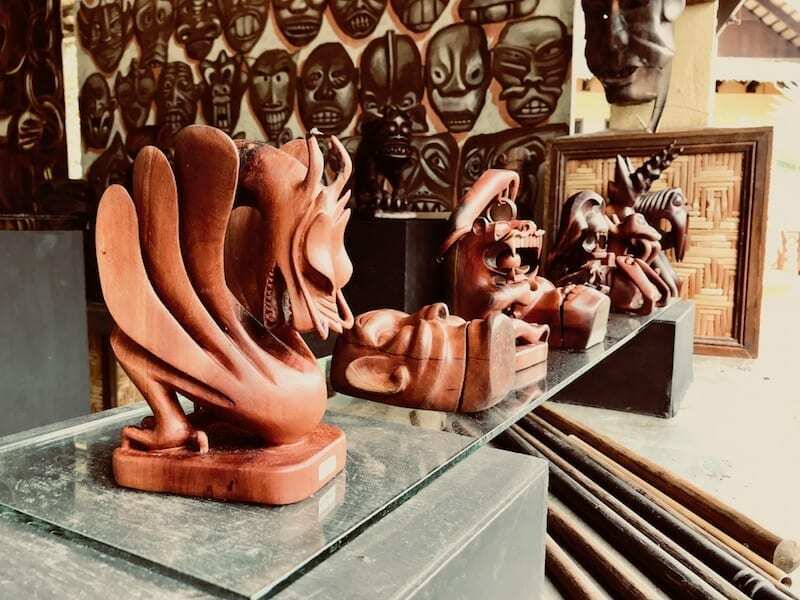 *** Although Malacca today is a tourism draw because of its UNESCO Heritage City status related to the Straits settlement (Peranakan) culture, this is not the emotional meaning that Malacca has to Malay people in Malaysia. The best way I can explain it is this: Malacca is to Malay folk in peninsular Malaysia, what Camelot is to Bretons. Previous story Complete Guide to The World’s (Almost) Oldest Rainforest! I’m Malaysian myself! :) And I just got back from Penang a couple days ago actually. Penang is awesome – you could spend any time you like there, there’s gonna be things to do. 3D Trick Art museum, Upside Down museum, Dark Museum, Cat Cafe, chocolate emporium – I’ve not been to all, they’re the places I thought I might want to see. The Baba Nyonya culture is the reason for the Heritage City status so visit a Kongsi or Peranakan mansion too. There’s a strong Indian Muslim community as well, so the Little India part is lively. All of this makes for AMAZING street food – go to Kimberley Street or Campbell Street. Anyway you won’t be short of people recommending food I’m sure. Don’t go up to Penang Hill on a weekend, go on a weekday. The funicular is super crowded on weekends.